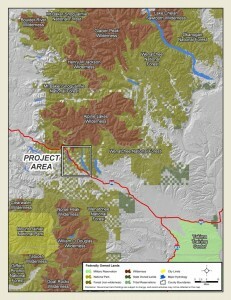 View of wild areas in the Cascades with a white box indicating the bottleneck habitat area that the I-90 project is within (click to enlarge). The landscape in Washington’s Central Cascades, spanning Snoqualmie Pass and bisected by Interstate 90, forms an important travel corridor for people, goods and wildlife. Interstate 90 is the transportation lifeline for freight and traffic connecting our state east to west. This same freeway bisects an area that US Forest Service biologists have long recognized as “a critical connective link in the north-south movement of [wildlife] in the Cascade Range”. These two important corridors, an east-west transportation corridor and north-south wildlife corridor, intersect in what is known as the I-90 corridor. A rich history of public and private investment has occurred in the I-90 corridor to conserve habitat, and efforts continue today. Washington State citizens, private foundations, the Washington State legislature, and the United States Congress have invested over $200 million in recent decades acquiring and protecting nearly 150,000 acres of habitat to maintain and restore wildlife’s ability to move through and live within this landscape. This conservation ranges from habitat immediately adjacent to the crossing structures on I-90 80 acres at a time to the historic creation of Washington’s first community forest in the Teanaway over 50,000 acres in size. This work was made possible and continues today through efforts by Forterra, The Cascades Conservation Partnership, The Nature Conservancy, Trust for Public Land, US Fish and Wildlife Service, US Forest Service, Washington Department of Fish and Wildlife, Washington Department of Natural Resources, and many others. Recognizing that the I-90 corridor is where these competing corridors intersected, the Washington State Department of Transportation (WSDOT) finalized a design to upgrade 15-miles of I-90 between Hyak and Easton that would create better connections for people and wildlife called the I-90 Snoqualmie Pass East Project. The initiation of the I-90 Snoqualmie Pass East Project design to address the 6-lane barrier carrying 27,000 vehicles a day led to the formation of our coalition. Learn more about this project unfolding now on Interstate 90. The quality of the habitat in the I-90 corridor has been degraded through past management activities including heavy timber harvest that removed many of the large trees wildlife depend upon, construction of logging roads, introduction of invasive species, and fire suppression. Restoration of these lands is a vital component of conservation in the I-90 corridor, and must consider both the balance of social and cultural needs for the landscape and increased resiliency to new threats from climate change. An all-lands approach is required in the I-90 corridor that combines restoration of our federal lands (primarily managed by the Okanogan-Wenatchee and Mount Baker Snoqualmie National Forests), state lands, and willing private landowners. Partners in this work to design and implement this restoration work include the Conservation Northwest, Mountains to Sound Greenway, US Forest Service, Washington Department of Fish and Wildlife, Washington Department of Natural Resources, many volunteers, and those land conservation partners above that still steward the acres the conserve. Wildlife monitoring is a vital component of both informing all of these strategies and understanding how they are impacting the presence and recovery of animals on this landscape. Several regional efforts gaining national attention overlap the I-90 corridor, helping to bring resources and partnerships to further work in the landscape. These include the Yakima Basin Integrated Plan and designation of the Mountains to Sound Greenway as a National Heritage Area.